Something I'm currently really enjoying is writing down everything that's on my mind and publishing it here on my blog. Recently it's been Bloggers Block, you can find this post three days ago and find out how I've been battling with bloggers block for a few months now. However, something I battle with more on a very frequent basis is pretending it's okay. 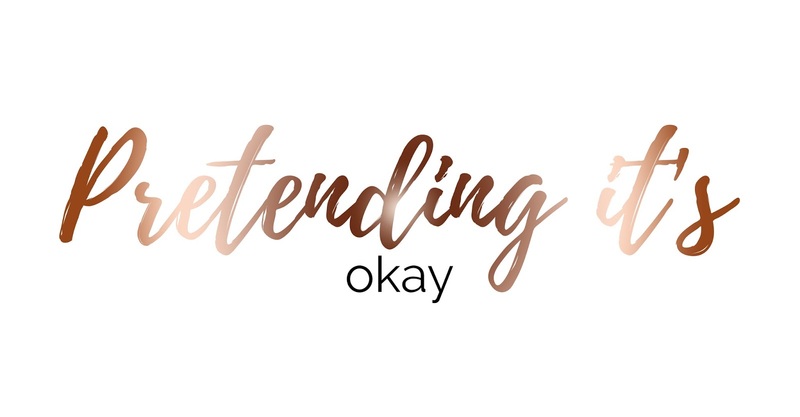 Now I'm writing this post today because in fact, today like most days is a day where I have to pretend that everything is completely fine even when it's really not. Now you're probably wondering why I have to pretend that it's okay and I usually have to do this for nearly everything but right now it's more to do with my personal life and a few people in it. After having pretty much a break down this morning and last night because I'm having to pretend that a situation is fine, when I don't think it is but can express how I feel; I've come to realise that it's pretending that everything is okay actually brings a lot more problems than what a lot of people may assume. While right now I'm supposedly okay with a situation which is creating a challenge, today and even yesterday won't be the only day that I'm affected. In fact, maybe even next week or even the week after that I will most likely, probably have a break down and it will be due to everything building up inside of me and I have no way of letting it out because I cannot express the way I feel without causing upset and confrontation and everything that I do not want to happen in between. So on the days when I'm having a complete melt down and I feel at my worst and the world is caving in around me and my boyfriend then questions why I'm like this sometimes because he really doesn't understand. I can turn around and finally say "it's because I spend most of my life pretending that every thing's okay without telling anyone, so some days I need to have these break downs to let everything out so I feel okay again". But that won't be the last of it, this circle of feeling like complete and utter crap will happen again after I've had the break down, and then it will happen again, again and again and this won't change. What do I do? Do I continue to feel like crap most days, or do I just cause upset and confrontation and still feel crap? Thank you if you have made it to the end of my rambling post. You mean the world to me.